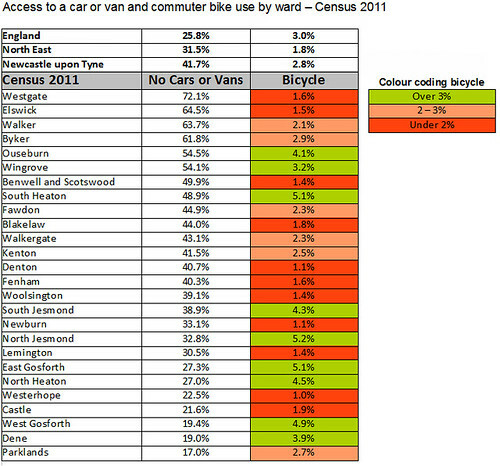 Newcastle cyclists want to see action by their council as Census 2011 data shows that over 40% of Newcastle’s households do not have a car. This new data makes it only fair to ask for much more space to be provided for walking and cycling. Novocastrians are less car-centred than civil servants make out and politicians are led to believe. Two out of five households do not use a car and cycling is on the rise, albeit slow. Campaigners are yet again to give literature to the decision-makers to bring them up to ‘walking and cycling speed’: a decelerated lifestyle and human-scale design are the key to better neighbourhoods and a good step towards letting kids play out again for social interaction, exercise and health, and a fairer transport system for all. On busy fast roads people would cycle if safe and ample space was provided in the form of cycle lanes and tracks separated from motor traffic. The high turnout at the successful mass cycling event Skyride was a manifestation of that sentiment. Together with the Dutch Embassy and other organisations the campaigners are putting together a conference ‘Love Cycling – Go Dutch’ to be held in November, to explain to the decision-makers just how the Dutch got their world famous and bustling bikeways. Katja Leyendecker of the Newcastle Cycling Campaign says: “Newcastle is in an excellent position to move away from car-centric planning and highway engineering. We are below national and regional average for car ownership and it’s only fair to start providing for non-car modes such as cycling. Newcastle says it wants to become a cycling city with 20% of short journeys done by bike (currently under 3%) and great cycleways. Whilst city transport policy is generally good, action is extremely poor.